The NADA Official Used Car Guide has added average trade-in values for 1-year-old Chevrolet Volt and Nissan Leaf sedans to its used-vehicle value listings. Both cars plug in. In its June edition, the NADA Guide will project the average trade-in value for a typically equipped 2011 Leaf SV electric car at $23,975 -- 95 percent of its sticker price of $25,280, after the $7,500 federal tax credit available to buyers who purchase the vehicle new. For comparison, a typically equipped 2011 Honda Civic Hybrid has a projected trade-in value of 76 percent of its sticker price, and a 2011 Toyota Prius has a projected trade-in value of 88 percent of its sticker price. Maynard Brown, an NADA Guide analyst, says the company treats the tax credit similar to a rebate because buyers of used Volts and Leafs are aware of the discount and are not willing to pay more for those vehicles than the new-car buyer paid. "It behaves more like traditional cash incentive versus a finance incentive that you don't see," Brown says. 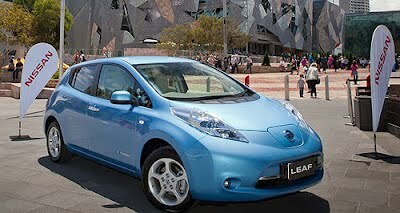 In the near term, Brown predicts that the values of the Leaf and Volt will remain stable because of low supply and high gasoline prices.